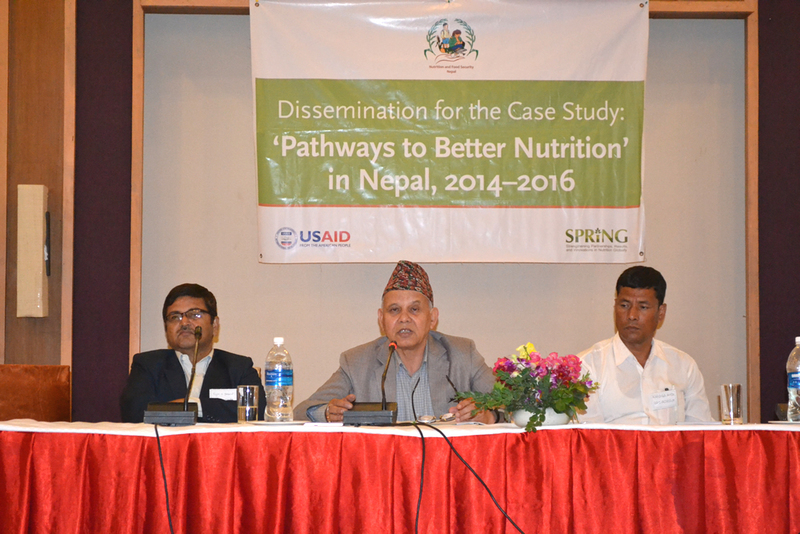 SPRING released findings from the multi-sectoral Pathways to Better Nutrition (PBN) Case Study during a national event in Kathmandu, Nepal on April 20th, 2016. 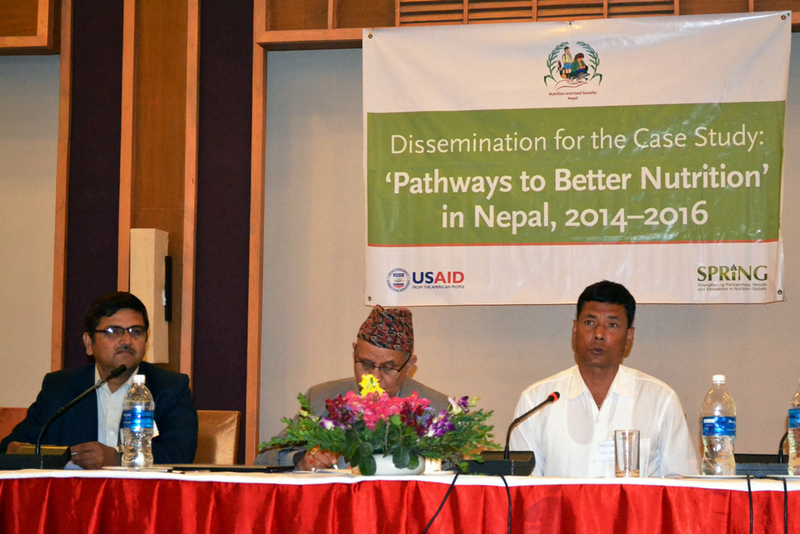 The National Planning Commission (NPC) chaired the event. 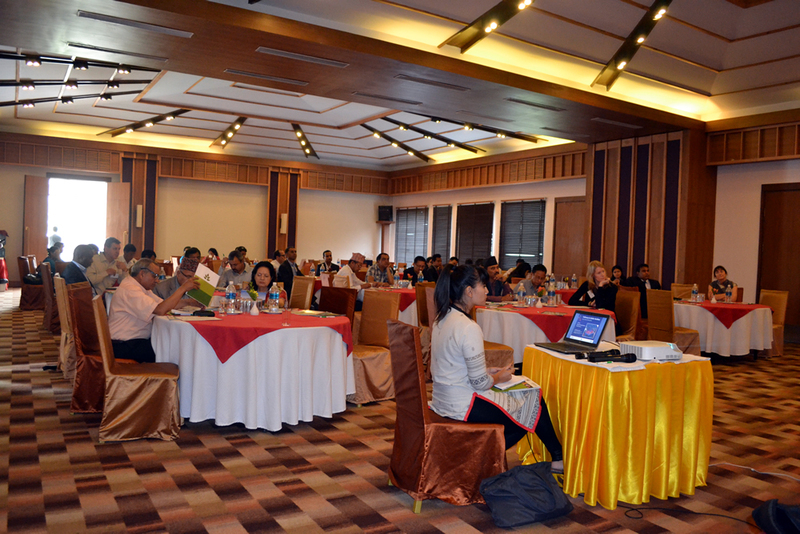 There were over 60 participants representing multiple government ministries, donors, UN groups, civil society, academia, and the private sector. 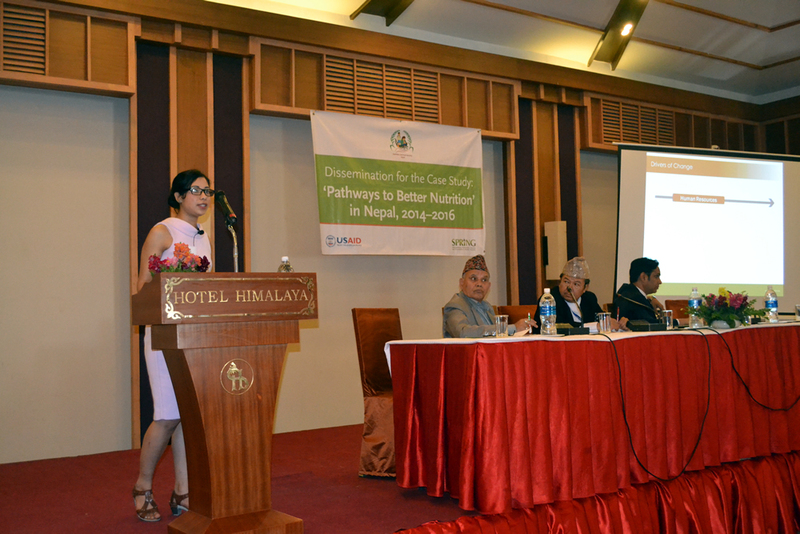 From the National Planning Commission, Professor Geeta Bhakta Joshi (Hon. 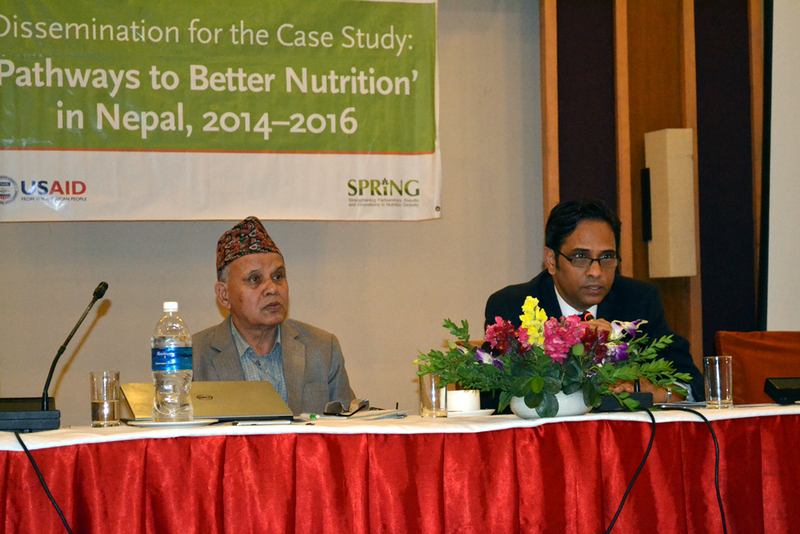 Member), Mr. Madhu Kumar Marasini (Joint Secretary), and Dr. Yagya Karki (Former Hon. 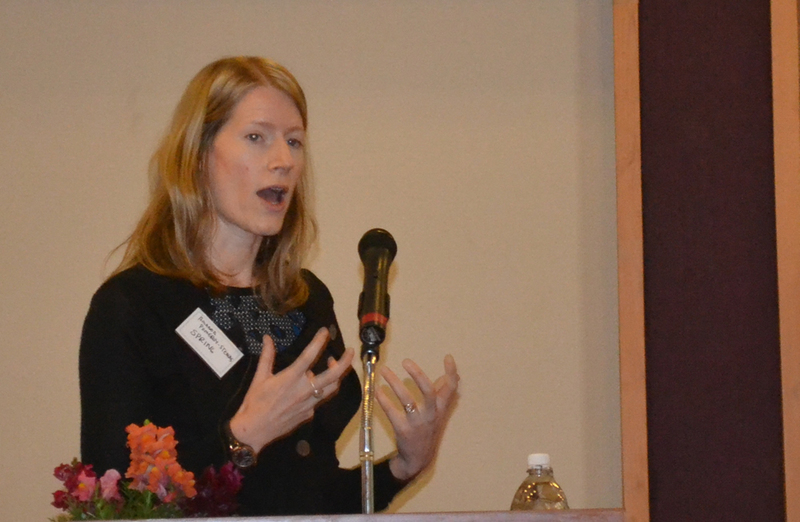 Member, not pictured) presided over the event. 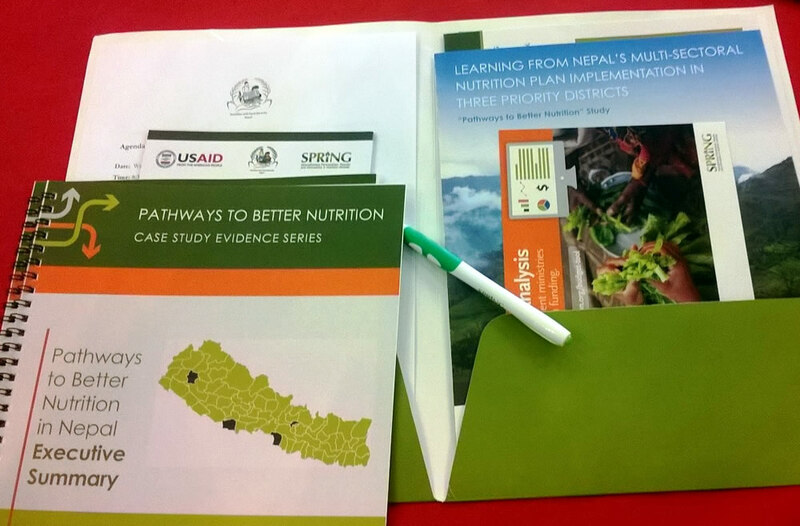 SPRING PBN team members Amanda Pomeroy-Stevens, Madhukar B. Shrestha, and Kusum Hachhethu presented SPRING’s findings from data collected between June 2014 and November 2015 at the national level (district level results for Achham, Kapilvastu and Parsa were presented earlier this year. 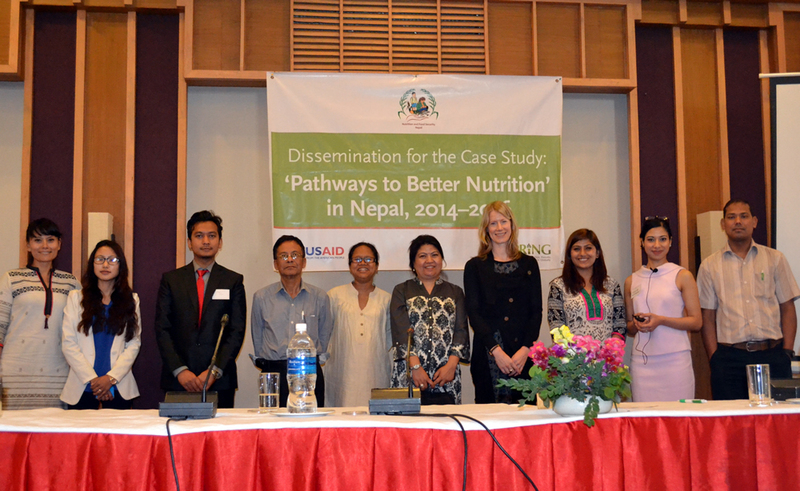 The findings were based on mixed method, objective, time-series analysis of the implementation of the multi-sectoral nutrition plan (MSNP), and found that prioritization and funding for nutrition had indeed increased for many stakeholder groups during the study timeframe. 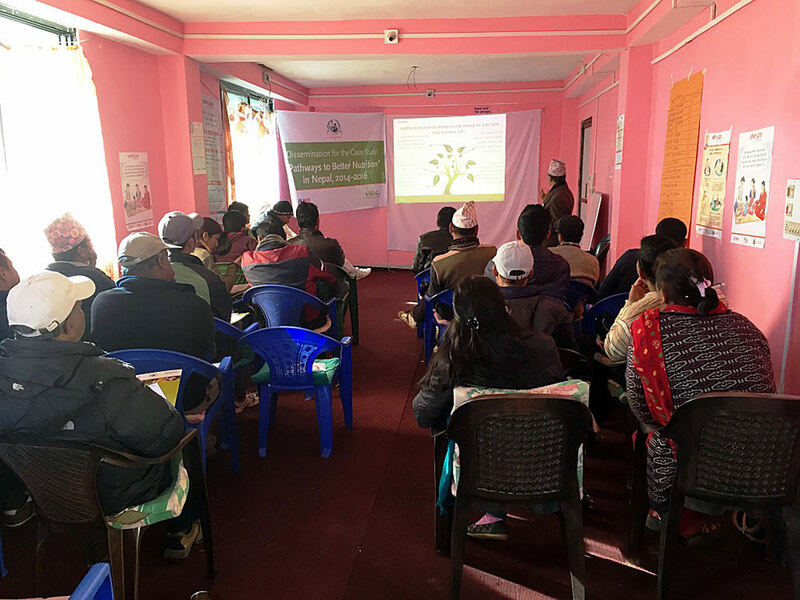 Based on these findings, as well as suggestions given by key informants and relevant global guidance, SPRING concluded the presentation by providing practical recommendations for how to address bottlenecks in the remaining years of the MSNP and beyond. 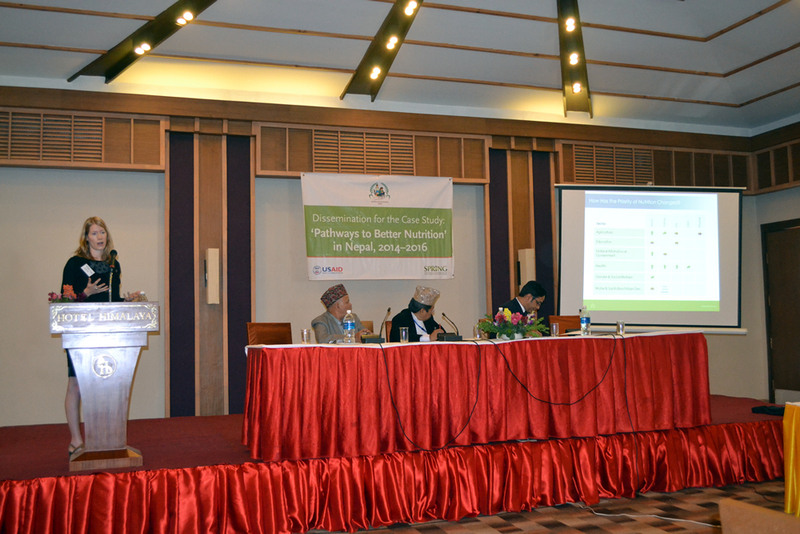 From the National Planning Commission, Mr. Madhu Kumar Marasini (Joint Secretary) chaired the event and provided summary comments (Dr. Yagya Karki, Former Hon. Member, NPC, also pictured). 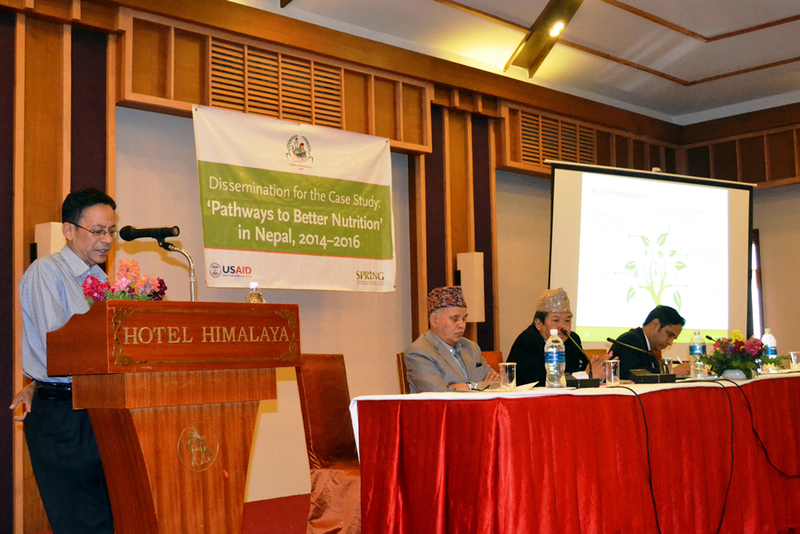 Mr. Madhu Kumar Marasini, Joint Secretary of the NPC and chair of this event, noted that many of the factors identified by the PBN study that increase prioritization and funding for nutrition are also needed to reach Nepal’s Sustainable Development Goals (SDGs) – “by combining [MSNP stakeholder] efforts; we can multiply the results. 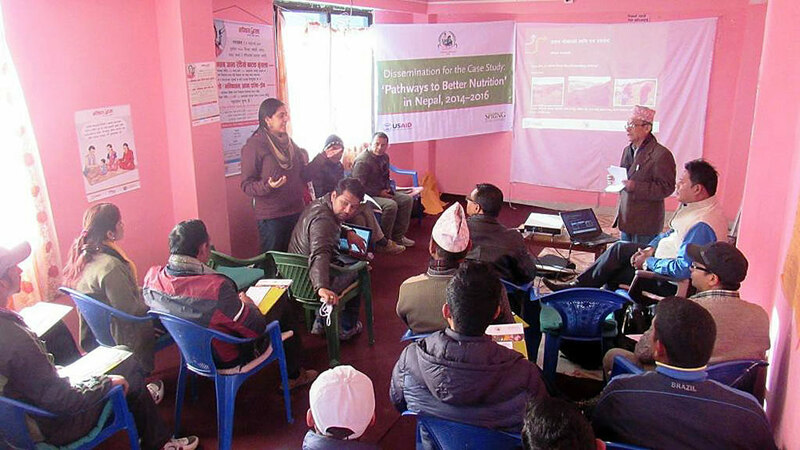 The fundamental principle of MSNP is also the same.” He noted that the study recommendations will be very helpful in achieving these goals and in the current development of the next three-year plan. 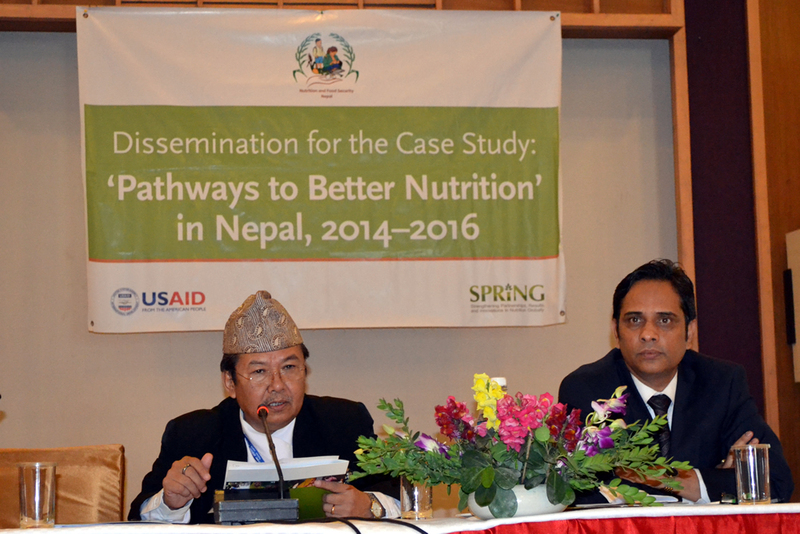 Photo at top: Co-Investigator Madhukar B. Shrestha presents the recommendations of the PBN Nepal case study alongside the Hon. Member, Former Hon. 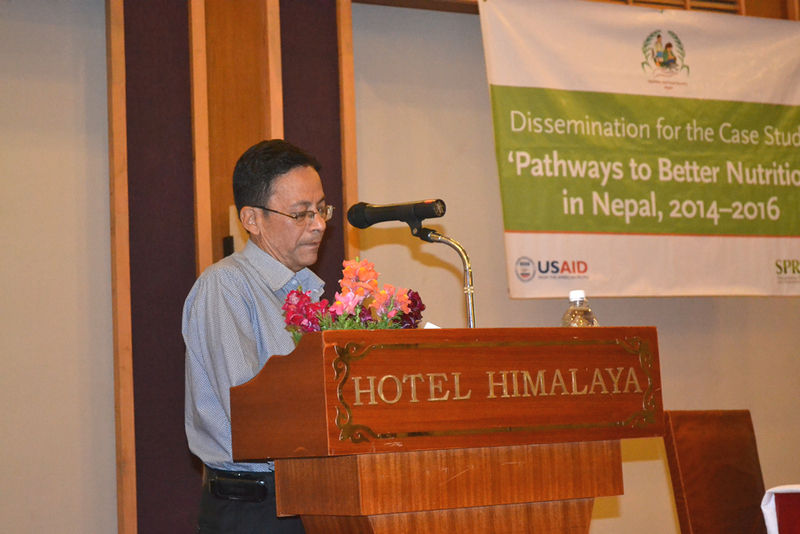 Member, and Joint Secretary of the National Planning Commission.